The Freistadt Danzig (Free City of Danzig) was originally part of the Germany - Plebis[cites] category, but it never really belonged there. It has now been moved to its own Danzig category. Some catalogs list the Free City of Danzig together with the other World War I League of Nations plebiscite territories. No plebiscite was actually ever held in Danzig or its surrounding geographic area. As decreed by the League of Nations in the Treaty of Versailles, this geographic region, formerly part of East Prussia in the German Empire, was to remain separated from Weimar Germany and from the new Republic of Poland. 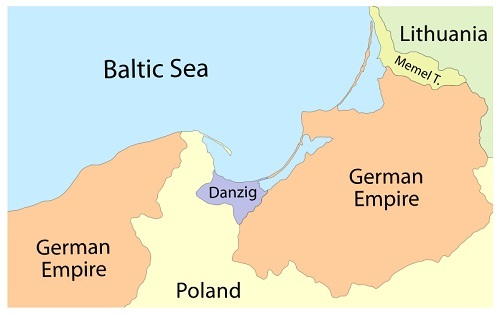 The Free City (State) of Danzig was thus created, in order to give the new Republic of Poland sufficient access to the Black Sea port, while recognizing that the population of Danzig Area was overwhelmingly ethnic German. To achieve this end, the new Free City of Danzig entered into a binding customs union with Poland, allowing the two parties equal access to the seaport. The Free City (State) of Danzig actually included the major cities of Danzig (Gdańsk), Zoppot (Sopot), Oliva (Oliwa), Tiegenhof (Nowy Dwór Gdański), Neuteich (Nowy Staw) and some 252 villages and 63 hamlets, covering a total area of 754 square miles. 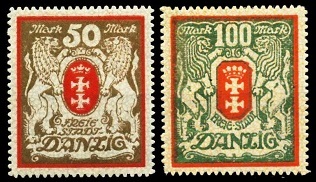 During 1920, the contemporary Germania and Representative Subject issues of Germany were overprinted in various formats for use in the Danzig area. The two stamps shown above are actually the "crown jewels" of every serious Danzig specialized collection, with the price of each one being equivalent to an average "mortgage payment". In 1921, the Freistadt Danzig was proclaimed, though it remained under League of Nations administration, with representatives of various Allied nations acting as the High Commissioner. At that time, Danzig began issuing its own postage stamps, utilizing the German language and German currency values. The Free City continued to issue postage stamps in its own name until 1939, when the territory was seized by the Third Reich. Poland also established a post office in the port city of Danzig, and they issued their own postage stamps, overprinted "PORT GDANSK", from 1925 through 1938. Links to page articles concerning Danzig history and postal issues will eventually appear in the Danzig Links sections at the top of the column at the right. Since Germany collecting normally includes the Free City of Danzig, and most Germany collectors use the Michel catalogs, the stamp descriptions in the page articles will include both Michel and Scott catalog numbers.